Fritzie Moraes Lobo has an overwhelming presence and a zeal for social reform to accompany it. Her sense of humour is evident right from the first instant of meeting her. One cannot help giving in to laughter when she recounts the process of establishing her NGO. Not one to suffer injustice, Fritzie has always been outspoken in matters that may or may not directly affect her, but violate her moral sensibilities. It was suggested that she found an NGO to voice and actively promote causes dear to her heart. Hesitance to have the tag of NGO ascribed to her did not hinder its evolution. There needed to be some organisation in place if she was to be taken seriously and she was aided immensely by her friend, Floriano Lobo, in her quest in this regard. ‘CRAC!’ said Fritzie. This was met with some amount of derision and confusion. She continued, ‘Well, everyone calls me ‘crack’ so I chose that name. But its full form is Citizens’ Rapid Action Committee.’ Thus on 2 December, 2003, CRAC was officially registered. The organisation is much influenced by the legacy of Flavia Moraes’ activities in the Swatantra Party. Fritzie was, in her own estimation, much inspired by her mother. The NGO has its fingers in many pies, so to say, from providing legal and medical aid to the downtrodden to promulgating various social issues and sensitising people in general regarding the same. These social issues include empowering the differently abled to having cleanliness drives. CRAC also believes in motivating the youth towards taking up social causes and is eager to collaborate with NGOs that function on the same wavelength and have similar objectives. The organisation is instrumental in creating financial emancipation through vocational training. The members of CRAC emerge from varied backgrounds. Fritzie, the president, was a purchase officer/singer by profession. She began singing at 16 years of age and is still called upon when she happens to grace a musical programme or event. Other members are social worker Zygal Vincent Lobo (vice president), financial consultant Varish Naik (treasurer), entrepreneurs Joshua D’Mello (secretary) and Clinton D’Souza (public relations) and fashion designer Farida Aga, who doubles as event organiser and provides vocational training in her profession to those mired in poverty. Sandesh Gawas handles the website for the NGO. Victoria Fernandes, better known as ‘Mummy’, is the honorary chairperson of CRAC. The organisation operates entirely on funds generated by its members and well-wishers. Fritzie is all praise for her supporters Prajal Sakhardande, Salim Isani and I J Virani among others. She jokes about being a nuisance to her reticent husband, Vincent Lobo, who gives in to her demands and silently plays a significant role as a benefactor. 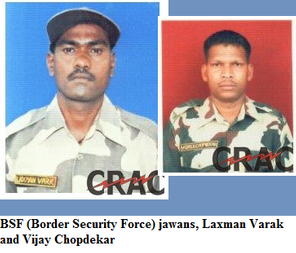 Among CRAC’s ardent allies are the uniformed men, BSF (Border Security Force) jawans, Laxman Varak and Vijay Chopdekar, who were honoured for their bravery in Kargil with medals. However, military honour has not brought in monetary security and both men have no place to call home. CRAC is making efforts to arrange for residential facilities for the men. 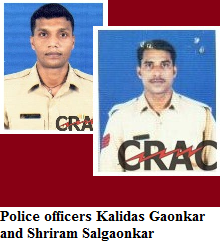 Kalidas Gaonkar and Shriram Salgaonkar are men true to the police uniform with which they adorn themselves. They give their heart and soul to social work even at the risk of detrimental effects on their careers. Shriram Salgaonkar in particular is known for his regular blood donation and willingness to donate blood whenever needed. CRAC has close ties with Vivian Niwas in Siolim, which houses children that have been abused and maltreated. 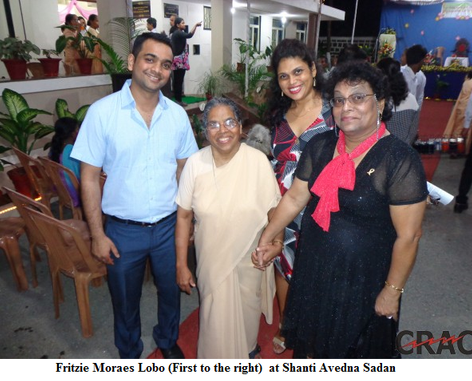 CRAC works with Shanti Avedna Sadan, hospice for those terminally ill with cancer and on 2 December, 2014, inaugurated the new wing for the hospice with Mass celebrated by Cardinal Oswald Gracias. It quite recently felicitated wildlife photographer Arnold Noronha, environmentalist Aaron Fernandes, wildlife conservationist Nirmal Kulkarni, police officer Shriram Salgaonkar and others with the Green Goa Awards to bolster a positive outlook and movement among the younger generation in terms of caring for society and the environment. Fritzie believes that recognition of their work will encourage them to continue in the same vein. In a bid to show appreciation and emphasise dignity of labour, CRAC has an event for Smiling Goa, its youth wing, where achievers from all walks of life are commended, including postmen, bakers and vegetable vendors. Mother-in-law Day is a unique innovation to aid and pay respect to elderly widowed women who have singlehandedly reared families. Helping Hand is its affiliated wing for women wanting to make a better life for themselves through financial security. There is also the Have a Heart Club for children and Past Tense for senior folks, both linked to CRAC. 4th June marks an unusual and special landmark in CRAC’s history. In the village of Gadag in Karnataka reside a thousand gypsy families. The sons of these families first came to the NGO for medical aid but since then have never broken ties. They requested that a branch of CRAC be opened in their area and so they were adopted leading to the declaration of 4th June as the independence day of the renamed Gypsy Town. There have been several other works CRAC has been involved with and any small change it can bring about is welcome, as some constructive change is better than no change at all. It continues in its indomitable spirit to reach out to those in need, stirring wayfarers in the process, in this journey called life.